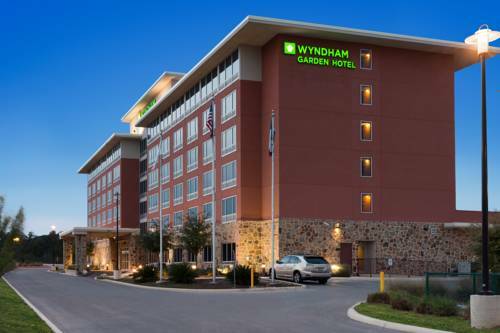 This Wyndham Garden San Antonio near La Cantera hotel provides the best stay in northwest San Antonio, with easy access to major companies and attractions via a complimentary local shuttle, spacious smoke-free accommodations and friendly, attentive staff. This hotel is also convenient to dining, world-class golf, The Shops at La Cantera, Six Flags Fiesta, University of Texas at San Antonio and South Texas Medical Center. Relax after a long day in the outdoor pool and hot tub, or work out in the 24-hour fitness center. A 24-hour business center lets you take care of work at any hour and complimentary wireless Internet access lets you stay in touch. An onsite restaurant serves up delicious Tex-Mex cuisine for breakfast and dinner and flexible meeting space to accommodate up to 100 people will make any event a success. Guest rooms feature a flat-screen TV and ergonomic work station while suites offer a sofa bed, refrigerator and microwave, ideal for extended stays.